Home / Coach Don Meyer / Life-Lessons / Are We Teaching Life? So, I read this article today. http://www.theindychannel.com/news/local-news/lifeline-law-there-to-save-underage-drinkers-when-theyre-in-trouble. In short, a college freshman at IU, fell down some stairs at a party. She was seriously hurt. No one called for help for at least 6 hours. She passed away. No one knows yet whether alcohol played a part in her death. There was alcohol at the party. Some blamed the "failure to notify" on being scared of the punishment for underage drinking. The Lifeline Law provides immunity for the crimes of public intoxication, minor possession, minor consumption, and minor transportation alcohol to persons who reveal themselves to law enforcement while seeking medical assistance for a person suffering from an alcohol-related health emergency. I think the law is good and let's people help others, but obviously the law was developed because there were emergencies that people weren't reporting. What's sad is that they had to create a law to offer immunity. To me this is teaching that it's ok to underage drink and party because if anything happens, we can call for help and nothing will happen to us. It seems like stories like this are becoming all too common. Are our youth not leaving home and going off to college with a learned responsibility-ness to understand what is beneficial and what is not? Are we doing our jobs to help educate students about the dangers of underage drinking? Forget underage drinking. Let's replace that last sentence with destructive decisions. Are we doing our jobs to help educate students about the dangers of destructive decisions? Are we doing enough to educate about unselfishness, accountability, responsibility, and humility instead of selfishness, independence with zero consequences, arrogance, and self-importance? Are we hammering home the don'ts, but not educating about the dos? I've always been taught that nothing good happens after 11:00pm. Please think about your actions. Please do that thinking before the action. I attended a basketball coaching conference a long time ago and Coach Don Meyer was the speaker. He hands these cards out to his players so that they can carry them in their wallets. Maybe you could carry one as well. 1. IS THIS A RISK I CAN AFFORD TO TAKE? 2. HOW WILL THIS AFFECT MY FUTURE? 3. HOW WILL THIS AFFECT MY FAMILY? 4. HOW WILL THIS AFFECT MY TEAMMATES AND COACHES? 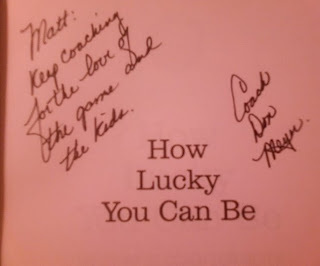 I met Coach Meyer and we chatted about his book and life. He signed my copy.